City Council Speaker calls on Albany for direct City control of rent regulations from Albany. On November 18, 2014, the Alliance for Tenant Power held a rally on the steps of City Hall to urge Albany lawmakers to strengthen the New York State rent laws when they expire in June 2015. The Alliance was joined by over 20 State and local officials. The Alliance for Tenant Power is a strategic partnership between Tenants & Neighbors, Make the Road New York, New York Communities for Change, Community Service Society, and the Legal Aid Society. According to the Alliance, New York City has lost hundreds of thousands of affordable rent-regulated units, and tenants living in remaining regulated units are increasingly unable to afford to pay the rent. There are 1.1 million units of rent-regulated housing in New York City, housing 2.5 million tenants. Present New York State rent laws are scheduled to expire in June 2015 and the Alliance hopes Albany does not simply extend the laws, but instead takes this opportunity to strengthen the rent laws to preserve affordable housing in low-income communities. The Alliance’s goals are to close loopholes they claim make housing unaffordable, and to repeal deregulation that has allowed landlords to move rent-regulated apartments onto the open market and out of reach of their current tenants. S1755 sponsored by Senator Liz Krueger and companion bill A 5473 sponsored by Assembly Member Keith Wright would close one loophole by prohibiting an owner from adjusting the amount of preferential rent, rent charged and paid by the tenant which is less than the legal regulated rent for the housing accommodation, upon the renewal of a lease; only allows the owner to make such adjustments upon a vacancy which is not the result of the failure of the owner to maintain a habitable residence. This is just one of many legislative priorities of the Alliance and their partners in Albany. New York City Council Member Ydanis Rodriguez added, “In order to preserve the character and affordability of our communities we must close the loopholes in rent regulation laws,” said Councilman Rodriguez “These laws must be renewed and these loopholes must be closed so that we can stop the trends that have caused the deregulation of over 300,000 apartments.” The Council member called on Albany to look past partisan lines and fight for the average New Yorker by renewing and expanding rent regulation laws. 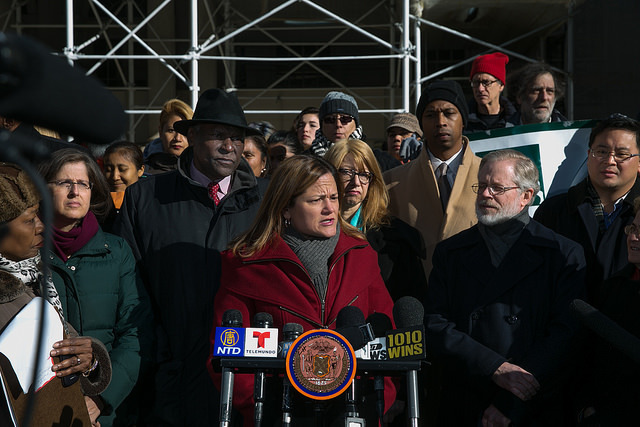 City Council Speaker Melissa Mark-Viverito also announced that the City would like to have the right to set its own rent regulations and plans to use the same strategies the Council used with Albany to secure Pre-K funding with earlier this year. Alliance for Tenant Power Rally, November 18, 2014, City Hall, NY, NY.